Movie Comment: Jupiter Ascending – BOBBY JAMES. The Wachowski siblings follow-up their wildly underrated sci-fi venture Cloud Atlas (2012) with Jupiter Ascending, starring Mila Kunis, Channing Tatum and Eddie Redmayne. 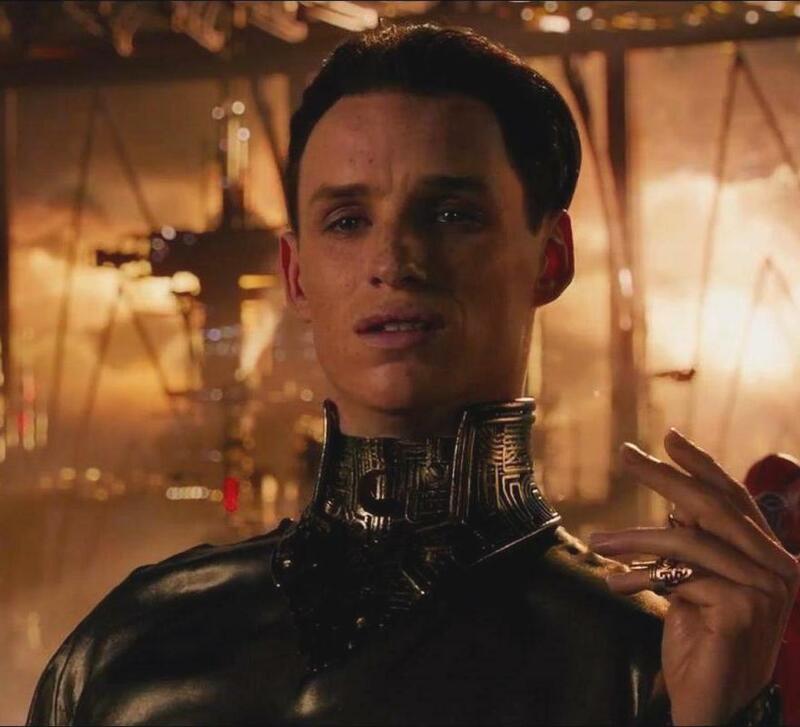 When Jupiter was first announced, I’ll admit, I was very intrigued – mostly because I’m a big fan of Eddie Redmayne as an actor and The Wachowskis as filmmakers. Mila Kunis is a respectable actress, depending on the material she’s working with – and Channing Tatum has been surprisingly improved in his last few outings. This had all the potential in the world – and like Disney’s [that deplorable thing] Oz, the Great and Powerful, it raised my hopes. I was expecting another venture I could love, like Cloud Atlas. After the credits had finished though, I felt deflated but satisfied. I was satisfied by Jupiter Ascending’s entertainment value. As a science fiction movie, it achieves its purpose of introducing audiences to intriguing ideas, visuals and worlds. From a design perspective, this is a beautiful movie – especially when you consider the work of Kym Barrett, the costume designer. Barrett had previously collaborated with the Wachowskis for The Matrix trilogy – and I think we can all recall Neo’s black leather ensemble. While Jupiter Ascending is referential to The Matrix, through its abundant use of black leather, Barrett introduces some contemporary design and vivid color. She uses Mila Kunis’ “Jupiter Jones” and Tuppence Midelton’s “Kalique Abrasax” to explore most of the color palette. For brief moments, these exquisitely bold and colorful designs distract us from the darkness and bleakness of space. They feel delicate and airy, light and sheer. They represent the breathlessness of the universe and unexplored beauty – while being contrasted with some brilliant dark and hard textured pieces (as seen in the image above). All of the costumes, especially Balem Abrasax’s (Eddie Redmayne) are incredibly detailed sights to behold. I particularly loved Balem’s costume the most because it felt confining, in a way signifying asphyxiation. It enhanced Redmayne’s minimalist acting style and externally represented his character’s internal conflict (more on that in a second) – as if he was choking. 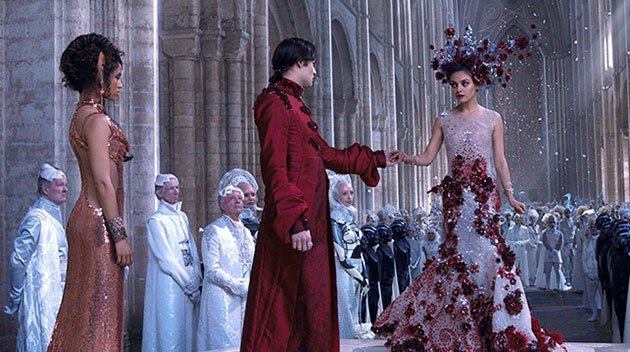 The costumes do a great job reflecting the characters’ personalities – and in doing so, become one of the most intriguing aspects of Jupiter Ascending. Equally as intriguing is Eddie Redmayne’s constricted and very quiet performance. While watching one of the trailers, I’d already decided I was going to love his work in this movie. There was a spark in his eye – and a look of painful reservation that resonated with me in those few seconds. After seeing the full movie, that projection of how good his performance might be was confirmed and reinforced. The minimalist style worked extremely well for a character clearly full of internal conflict. I’d have preferred the Wachowskis made a movie focused on the familial relationships and interactions between the three Abrasax siblings more at first – then their conflict with Jupiter Jones and Caine Wise (Channing Tatum). Instead, Jupiter was hunted across the universe (quite literally) by a bunch of forgettable, unnecessary characters. I was much more interested in the moment she would come face to face with Balem – and that unfortunately fell flat. The ideas and vision were great, as were some of the central themes (life beyond Earth, the plight of bees/humanity, life as commerce, etc.) – but perhaps the Wachowskis would have benefited from an extra set of editing eyes. I won’t say Jupiter Ascending is a bomb, because its heart is in the right place – and because it is entertaining (and beautiful) cinema, but I will say it needed a tighter narrative focus and less characters.